What do Raccoons and clean cars have in common? Photo: Northern Lights from Shoreline? Junior Gardeners, join Barb Ogaard of Bats Northwest for a slideshow presentation on these spooky dark flyers! Barb will also bring some live bats for you to see. Class size limited to 50, please RSVP by phone 206-546-4851 or email ASAP. Free, but cash or check donations to Bats Northwest will be accepted gladly. The efforts to save the Cedarbrook School property as a Community Park continue. 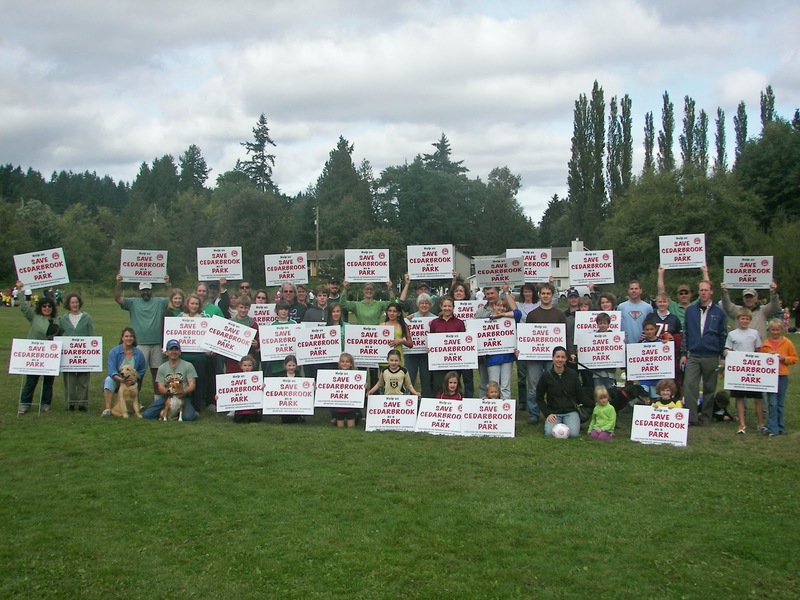 At the end of last year, the City of Shoreline, as part of their effort to engage the public in planning for the future, held a series of open houses and Stakeholder Meetings to help update the Parks, Recreation, and Open Space Plan (PROS). As a result of these meetings and the continuing efforts of Cedarbrook Coalition members, the Cedarbrook School property was identified as a property of interest and was included in the revised PROS Plan. As a result, the City of Shoreline can now engage in official conversations with the Shoreline School Board concerning the acquisition of the property and direct staff to research possible funding sources. This is a huge step in the eventual acquisition and preservation of the property. In addition, the Cedarbrook Task Force, composed of representatives from the Cities of Shoreline, Lake Forest Park, and the Cedarbrook Coalition continue in their efforts to find creative ways to secure the property for a future park. In an effort to help local residents make informed decisions when voting in the upcoming elections, the Cedarbrook Coalition has prepared a short Candidate Survey to gauge the support of our local candidates for the acquisition and development of the Cedarbrook property as a community park. Candidates from Shoreline, Lake Forest Park, and the Shoreline School Board responded promptly, and the results may be found online . We urge everyone to take the time to read the responses of our candidates and use this information accordingly. Your Vote Counts! We urge all citizens to VOTE ON NOVEMBER 8, 2011. 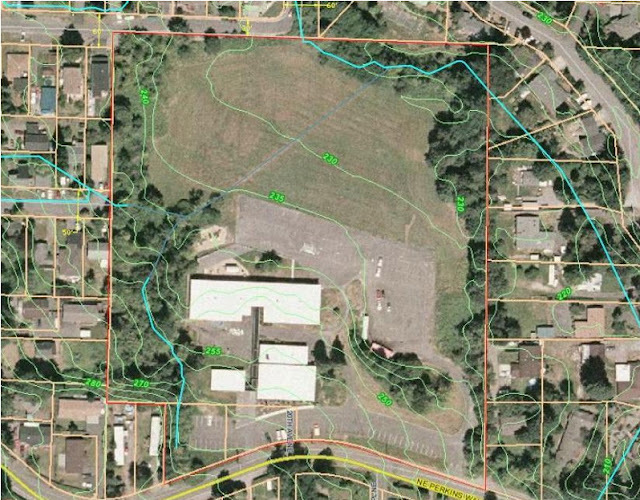 The Cedarbrook school site is a surplused property belonging to the Shoreline School District. The school building is on Perkins Way in Shoreline. Formerly Cedarbrook elementary school, it was last used well over 25 years ago. During building modernization in the late 80s, it was used as a transition school. Then it was used for special programs, such as Hi-Cap. Finally, it was rented out to a private school. It has been vacant for several years. The play fields border Lake Forest Park and the property boasts a small stream, called Whisper Creek. The Park Volunteers program organized by the Lake Forest Park Stewardship Foundation successfully concluded its first season of work parties with groups in all four parks on Friday September 23, 2011. Volunteer coordinator Linda Holman said "We worked in all four parks and a tremendous amount of work was done by the volunteers." Volunteers finished the year with a picnic on Sunday Sept. 25, as a "thank you" and to celebrate a job well done. For the future, the LFP Rotary is taking over Blue Heron park and will carry on the work there. "Next season we will begin having work parties on Saturdays. We have new and exciting projects coming up in the parks along with our continued maintenance." If you are interested in being involved in future work projects, email Linda Holman. Wet weather is upon us, and you may be thinking to yourself: but what can I do to help reduce water flows in my neighborhood? The solution is simple: adopt your storm drain. This program, spearheaded by volunteer members of Lake Forest Park’s Environmental Quality Commission, aims to connect residents to their water bodies, by helping them realize that anything they do at home—whether it is from their cars, gardens, or houses—directly affects their local streams and lake. If you don’t have a storm drain outside your house, do not fret: the program also allows for adopting your street’s culvert (enclosed drains used to channel water) or open swale (dedicated area that allows for natural drainage). The requirements are simple: keep an eye on your storm drain, remove trash or excess debris if you see it blocking flows, and be aware if you see any odd substances or discharges going down the drain. Your role is more of a stewardship commitment than a daily duty so it’s a great way to help out your community without dedicating routine time every single day. If you’re interested in participating in the program, please download the agreement form on the City website. You can also obtain a copy by calling the City of Lake Forest Park’s main line: (206) 368-5440. Really interested in stormwater and water quality? Take the City’s quiz to test your savvy! Results will be posted to the City site in mid-October. 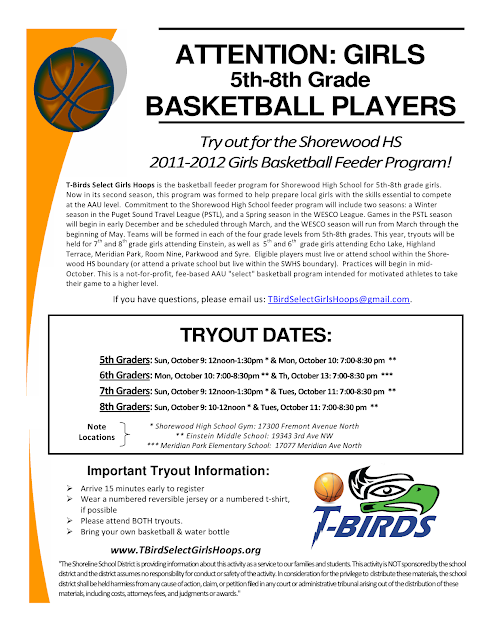 T-Bird Select Girls Hoops is a developmental feeder program for Shorewood High School, in the Shoreline School District. The overall objective of the program is to develop each athlete’s core fundamental skills within the team setting. 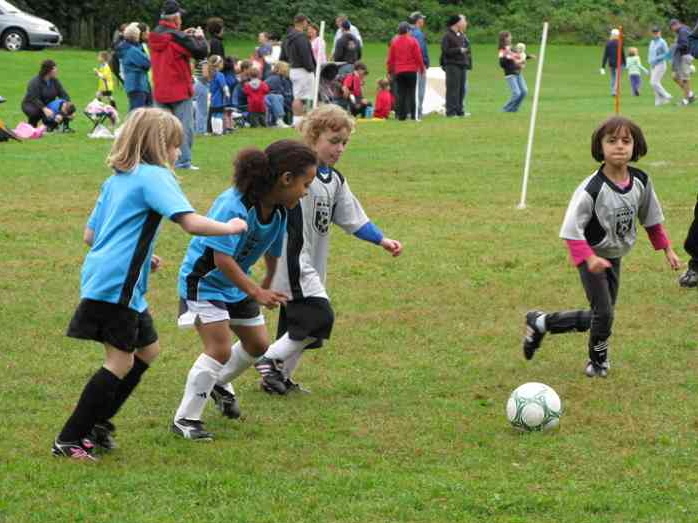 It is our hope that through involvement in the feeder program, we will prepare our girls for eventual play at the high school level, though participation in the feeder program is not a guarantee that any player will be chosen for a high school roster. We are a volunteer-based organization, established to provide an opportunity for girls to develop basketball skills and play basketball in a competitive environment. The 2011 Spring season will participate with approximately 12 other girls' feeder programs representing local high schools in the WESCO Youth Basketball League (WYBL). Players must live within the Shorewood HS enrollment boundaries or attend a school that feeds into Shorewood High School. This year, tryouts were held for 7th grade girls attending Einstein, as well as 4th, 5th, and 6th grade girls attending Echo Lake, Highland Terrace, Meridian Park, Room Nine, Parkwood or Syre. Players who live in the Shoreline School District, and attend private school or are home schooled, are also eligible to play on T-Bird Select Girls Hoops teams. 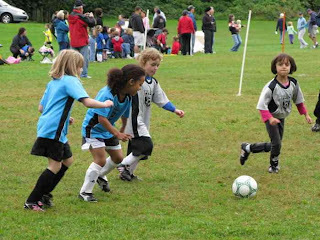 Teams have been formed in each of the four grade levels from 4th-7th grades, with the 4th grade team “playing up” as a second (or “B”) team at the 5th grade level. This year the program expands to include 8th grade. If you have questions about the program, email. owned by Marly and Bob Champion. Cruise the Ave So They Shall Walk is classic cars, trade show, and swap meet, all to take place on Sunday, October 3, at the Aurora Sears Plaza. The Cruise begins at Shoreline Community College where the drivers will have breakfast between 7:30 & 9 am. SCC President Lee Lambert is the Honorary Inaugural Cruise Meister and will join Alan Howard of Evergreen Speedway in the Speedway Pace car. SCC to Aurora, south to a 146th U turn. North to 182nd, right turn to Midvale, back to 175th. From there back onto Aurora to Westminster where the cars will be pulling into the upper Sears parking lot between 10 - 10:30. 2010 entry. 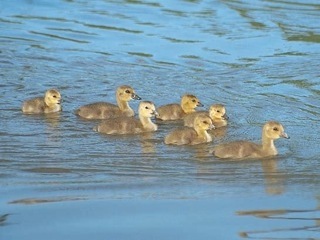 Photo by Mark McVeety. Organizers say they expect anywhere from 150 to 200+ cars of all make, models & years along with 2012 Cadillacs from Doug's Cadillac, 2012 Mustangs, Volts, Corvettes, and Focus from Bill Pierre Auto Center and 2012 Kia Souls and a showroom condition 1962 Chevy pickup from Chuck Olsen. The Shoreline Rotary lunch bunch will hold its Rotary Rummage Ramble in the company of up to 75 other Swap meet, Trade and Crafts vendors who will set up around Sears between 7:30 - 9:30 am. According to They Shall Walk Director of Resources Les Neu, "Sears has given They Shall Walk the ok to hold 1st Sunday of the Month Shoreline Community Swap meets every month, 12 months a year. Rain, shine or snow. This town needs a good Swap meet aka flea market." They Shall Walk, originally based in Shoreline, is a 501c3, non-profit, medical research and development laboratory in the process of developing the LIFESUIT, which will enable paraplegics to get out of their wheel chairs and walk. Open to ALL Vehicles and licensed drivers. 9:30 – 10:30 am - Registered Cars Drive from 160th Street to Aurora Ave. Turn right on Aurora to 147 St. or 146 St. U turn. Cruise North on Aurora to 187 St. Turn right onto Midvale and line up for the ribbon cutting on 175 St. & Aurora. 10:30 – 11:30 am - All Registered Classic / Custom / Hot Rods arrive at Aurora/SEARS Plaza for Car Show. 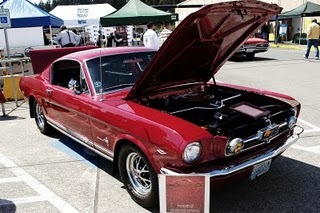 7:30 – 9:30 am Shoreline Community Automotive Swap Meet, Trade & Crafts Fair tables/tents set up around SEARS store**. Booth Registrations-$50.00 donation. 9:30 am Swap meet, Trade & Crafts Fair Opens. 12:30 pm -They Shall Walktm LIFESUITtm Demonstration. 1:30 – 2:30 pm - Community judging of cars in all classifications. 3:00 – 3:30 pm - Prizes / Awards presented. Show closes. 1 Free Book of Raffle tickets (5) ALL PREREGISTERED Show/Cruise cars. Additional Prize drawing Ticket books - $5.00 donation. Preregistration closes Sept. 15, 2011. For more info call, text or email: Les Neu, Resource Director, They Shall Walktm 206-229-8234. What do Blink® electric vehicle (EV) charging stations, a car show, an automotive swap meet, a trade and crafts fair and They Shall Walk all have in common? They will all be outside of our Sears store in Shoreline, WA on Sunday, October 2 for a special event! The Cruise the Ave so They Shall Walk event (free admission; $20 donation for car registration; hours: 9:30am – 4:00 pm) will include classic cars cruising on Aurora Avenue, starting at Shoreline Community College and ending at the Sears parking lot in Shoreline, WA (15711 Aurora Ave N, Shoreline, WA), where there will be a variety of booths set up for the trade and crafts fair. This event supports the nonprofit organization, They Shall Walk, which is a medical research organization founded to raise awareness of the plight of disabled persons and develop technology to improve their quality of life. Prizes for best car in classifications ranging from alternative fuel car to fan favorite will be awarded at the end of the event. While you’re checking out the booths, be sure to stop by and see Sears’ newly-installed Blink® EV charging stations at the Northeast corner of the event. In June, ECOtality and Sears Holdings announced a pilot program to install Blink® level 2 EV charging stations at 10 Sears retail locations as part of The EV Project, and the Shoreline Sears store is one of those 10! The EV Project will provide an EV infrastructure to support the deployment of EVs in various markets across the country. More Blink® EV charging stations will soon be available at additional Sears stores in Washington and other states, so stay tuned! For information on sustainability initiatives at Sears Holdings, visit our Environmental Sustainability website and follow @EnviroSears on Twitter. Symetra Financial and the Seattle Seahawks honored Shorecrest High School teacher Jennifer Etter as a “Symetra Hero in the Classroom” on September 23, 2011 during a special school assembly. Etter is a ninth-grade teacher at Shorecrest. “Jennifer Etter successfully combines what teens need to learn in school and in life in a classroom environment of mutual respect, where learning is cool. I admire a teacher who can turn on a light in a teen’s brain, all the more remarkable when the subjects are English, grammar, Shakespeare and poetry,” said Susan Garber Yonts, the parent of two of Etter’s students. “Ms. Etter lays out a difficult coursework syllabus, but her investment in her students is clear. These are freshmen girls and boys, who over the course of the year walk out of her class as they should — a little exhausted, a lot challenged and proud of their accomplishments.” Garber Yonts nominated Etter for the Symetra Hero in the Classroom award. Etter is one of 24 K-12 teachers across the Puget Sound area who will be honored for educational excellence in the Symetra Heroes in the Classroom program during the 2011 NFL season. Teachers are recognized in front of their students and peers at surprise in-school presentations, where they receive tickets to a Seahawks home game. They also are acknowledged during an on-field presentation at CenturyLink Field. Etter was recognized at the September 25 Seahawks game when the Seahawks took on the Arizona Cardinals. Teachers may be nominated by their principal, district staff, student or student’s parent. The winners are selected based on their ability to balance the core curriculum with students’ individual needs; build trust among students, parents and the community; and invest in their students’ long-term success. In addition to honoring exceptional teachers on and off the field, each of the schools represented by a 2011 teacher Hero is eligible for an MVP Award, which provides funding to enhance learning in Seattle-area schools. Three $10,000 grants will be awarded at the end of the 2011 football season. More information about Symetra Heroes in the Classroom. Symetra Financial Corporation (NYSE: SYA) is a diversified financial services company based in Bellevue, Wash. In business since 1957, Symetra provides employee benefits, annuities and life insurance through a national network of benefit consultants, financial institutions, and independent agents and advisors. 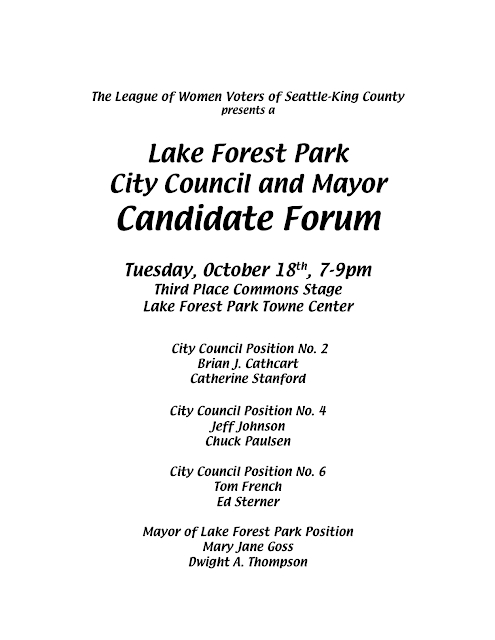 A Lake Forest Park City Council and Mayor Candidate Forum will take place on Tuesday, October 18th, 7-9pm at the Third Place Commons Stage in the Lake Forest Park Towne Center. The event is sponsored by the local North King County Unit of the League of Women Voters of Seattle-King County. 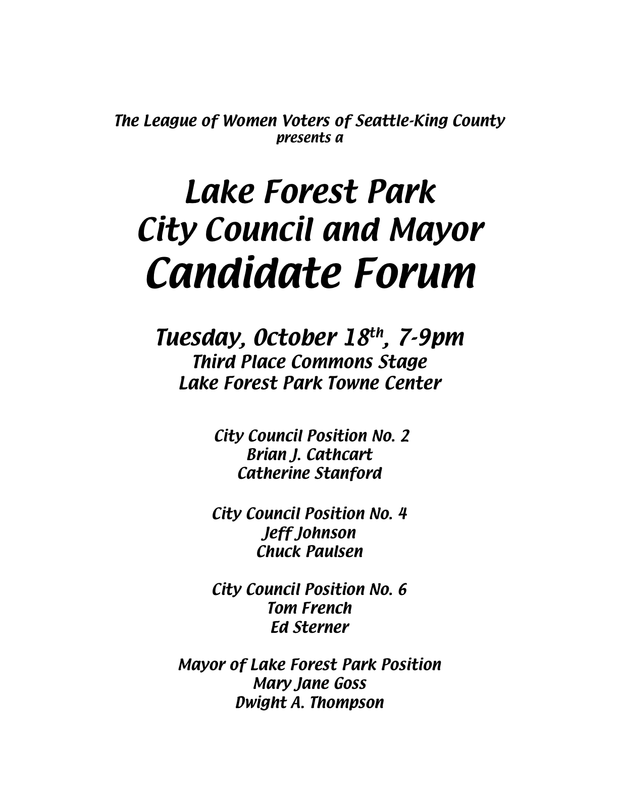 Candidates for City Council Positions No. 2, 4 and 6, and the Mayor's Position will be present to state their positions and take one minute spoken or written questions from the audience. After 20 years of service, over 30 scouts reaching Eagle Scout status, and guiding hundreds of boys who participated in the troop over the years, Gary Buck has retired from the role of Troop 325 Scoutmaster. At the well-attended BBQ, Master of Ceremonies, Phil Smart described Gary Buck as caring leader, skilled outdoorsman, and "all-round good guy". 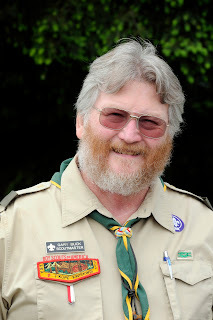 Gary attended 20 summer camps and two National Scouting Jamborees, supervised hundreds of outdoor trips, is a member of the BSA Order of the Arrow, and has received countless scouting awards. When Gary wasn't teaching scout skills to energetic young men, he was schooling adults in cribbage and backgammon. 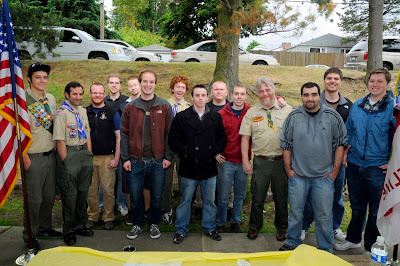 Numerous parents and scouts recalled fond adventures with Gary and thanked him for his dedication and service to the troop. Gary will continue to serve the troop as Assistant Scoutmaster and Eagle Scout Advisor, with a new focus on guiding boys to complete their individual advancement goals and ultimately reach the pinnacle rank in scouting, Eagle Scout. Gary liked to remind boys that only 1% of boys in scouting reach the rank of Eagle and that he wanted to help them all strive to be reach their full potential, be a good citizen, and most of all have fun with their fellow scouting friends. Bob Plaag will be taking over Scoutmaster duties for Troop 325 for the next year as the troop committee works through the process to identify a new Scoutmaster. Troop 325 is a boy-led troop with boys participating from age 11-18 years. The troop meets Monday evenings at First Lutheran of Richmond Beach church. For information about the troop, please call Suzanne at 206-533-6439.
shake hands in Xian, China. Photo courtesy SCC. President Lee Lambert has signed a memorandum of understanding that may result in a 400-bed student housing facility built on or near the campus. While excited about the potential, Lambert cautioned that the agreement is just a first step with many details to be clarified. That willing partner is David Lee and Partners. Lee is a local businessman with ties to the telecommunications industry in the U.S. and China. If the project goes ahead, Lee’s company would be responsible for all design and construction costs. The college would be responsible for getting approval from the appropriate state agencies and assisting David Lee and Partners with local permitting and approval processes. The college would also be responsible for amending the Master Development Plan, which is just now moving through the city of Shoreline’s review and approval processes. As currently submitted, that plan doesn’t include housing on the campus. Any potential off-campus housing project wouldn’t be included in the Master Development Plan, which focuses just on the campus. One of the main items that would need additional scrutiny is just where such a project might take shape. The agreement talks about the possibility of an on-campus location with two levels of underground parking and built to LEED Gold environmental standards. Lambert said David Lee and Partners is committed to using cutting-edge green technologies in construction and that any on-campus location must address the already tight parking situation. However, the location could change, he said. Shoreline draws students from across the state, the country and around the world and being able to offer housing could be an important factor in attracting them to the college. Shoreline now receives less than half of its operating funds from the state making the college more reliant on tuition, grants and contracts. If built, the project would also be of significant help in recruiting more international students. About 600 students from 34 countries attend Shoreline, a number that has bounced around by about 10 percent over recent years. Currently, Shoreline’s international students live in homestay arrangements or rent housing. In 2010, Lambert announced a strategic initiative to grow that number to 1,000 in five years. While he has said that adding college housing isn’t necessarily required for program growth, it is very helpful. Other community colleges who have added housing have seen their international-student numbers grow in recent years. Edmonds Community College officials added housing three years ago and their numbers have continued to rise as have those at Green River and Seattle Central community colleges. Besides building the housing, David Lee and Partners is also offering Shoreline a base for student recruitment efforts in China. “They have a beautiful new building in Xian and have offered us space in that building,” Lambert said. A quick series of events unfolded over the next ten minutes. Unified in a single purpose, this strange man who approached me on the street and I worked together to exhaust every option we could think of for rescuing the chicks on our own. 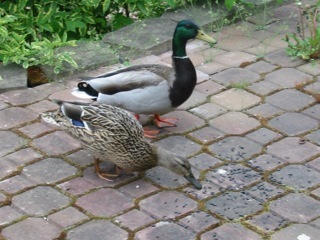 Other neighbors began appearing to offer their suggestions, someone affixed a large colander to a broomstick with duct tape in an attempt to scoop up the ducklings, and the female Mallard stood by us, quacking occasionally as she patiently watched us all work. Grabbing his cell phone when it became quickly apparent that we needed more assistance, the man who approached me plunged through a series of phone calls that began with calling 911 (before I could stop him), involved a repeated and harried description of the situation (in which he kept using the word "chicklettes" in place of "ducklings") and finally ended with Animal Control responding faster than I've ever seen the SPD respond when called upon (...but we won't go there right now). Neighbors scattered, I went back to my gardening work and, checking in every so often, I noticed that Animal Control (two men in official uniforms with a truck containing all the proper tools for such a rescue) spent at least two hours carefully coaxing out to safety every last duckling and planning the location of their safe re-release at a large, nearby body of water. The entire event was as humbling as it was comical and brought to view the plight of the wildlife that daily attempts to navigate their way along our streets and sidewalks, our gardens and greenbelts, scavenging for food, dodging cars and attempting to protect their young from disasters at every turn. Almost every day, in my job, I have a conversation with someone about making their garden more "wildlife friendly" and obtaining certification for it as a wildlife sanctuary. Some times people ask me, "What's the point?" or "What benefit does it provide me to do that?" I'm always very polite to these people as I talk up the entertainment and education value of attracting a diversity of wildlife to their yard before I go on to extoll the praises of how low-maintenance a wildlife sanctuary can be. If they're still listening at that point, its then that I dive into the deeper, richer conversation about the "bigger picture" - building green corridors for wildlife through cities and neighborhoods as well as the difference it can make to provide reliable food, water and shelter for local (all too often invisible) wildlife. 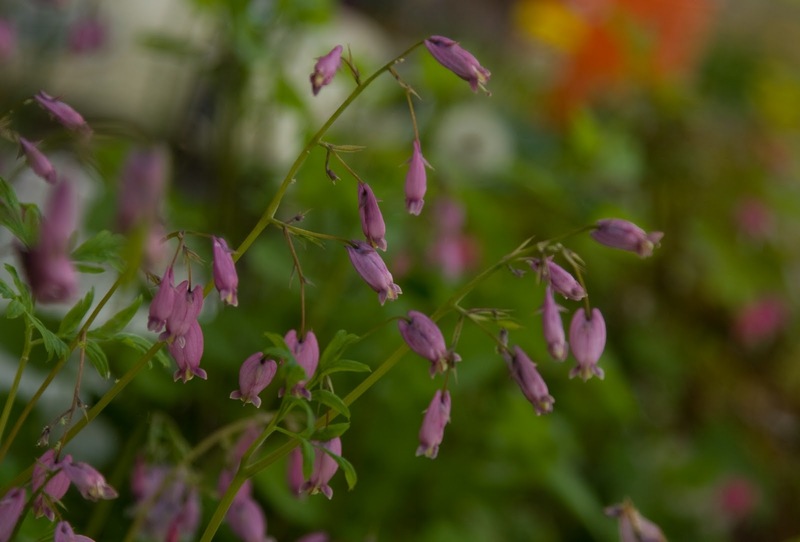 I've written many times about the basic ingredients of a wildlife-friendly garden. Christine Southwick, board member for the Puget Sound Bird Observatory and regular contributor to the Shoreline Area News also writes about these requirements in her column “For the Birds.” The information is readily available and easy to initiate - Food, Water, Shelter, and a Place to Raise Young. A wealth of resources are available about this topic through the WA Department of Fish and Wildlife and the National Wildlife Federation. 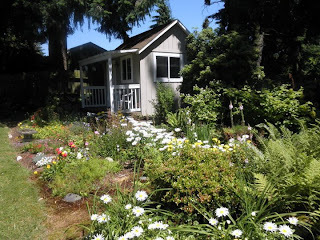 This is part of the very reason why Shoreline holds an annual "Where Our Wild Things Are" Backyard Habitat Tour. The thing to keep in mind is that a garden that invites and cares for wildlife is not a "perfect" garden - in the traditional sense - but is instead a deeply satisfying garden because it takes care of you, the environment and the wildlife (rather than you laboring or paying someone to labor non-stop over it). What I observe, but so rarely am able to talk about, is that despite (or perhaps because of) our fast paced, high tech lifestyles that seem bent on removing us from our contact with the natural world, that we yearn for more contact with nature and each other. I believe that we haven't yet forgotten that core connection between ourselves and all other forms of life on this planet. And I believe that many of us, because of that innate connection, when confronted with a particular situation, would care enough about wildlife to approach a complete stranger and ask for help. Jennifer Rotermund is the owner of Gaiaceous Gardens (an urban farming and wildlife gardening business with a teaching garden/urban farm and certified wildlife habitat/ sanctuary located in Shoreline). She is certified by the National Wildlife Federation as a Habitat Steward and is a Docent with the Krukeberg Garden. 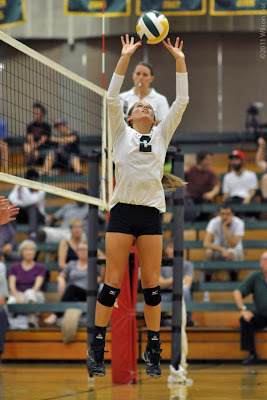 Lisa Day flies high for a kill. 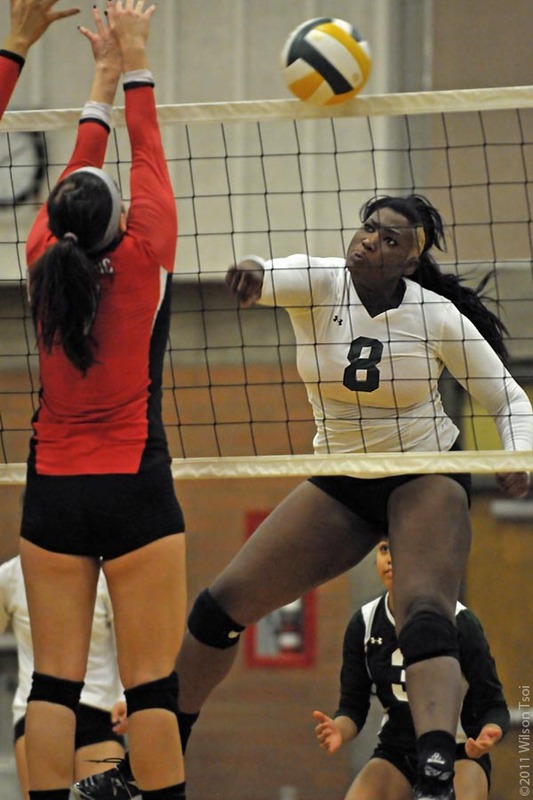 Shoreline Community College’s volleyball player, Lisa Day, was named the NWAACC Northern Region Offensive Player of the Week. 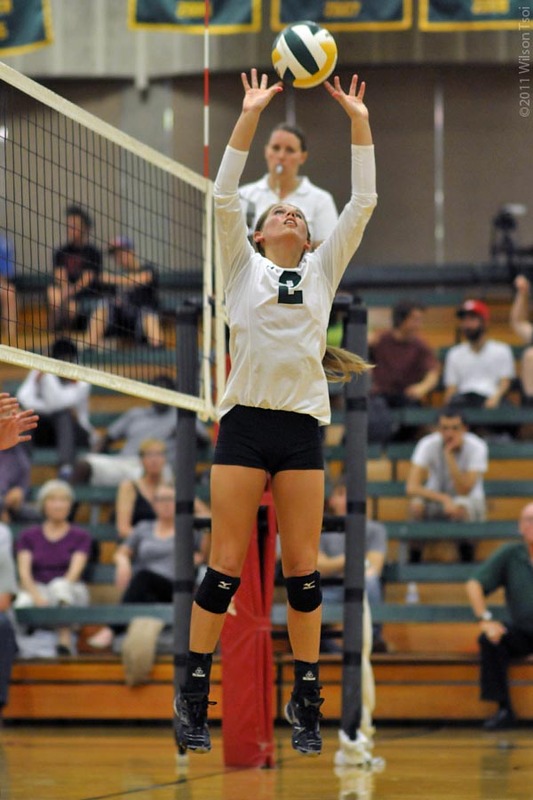 Day, a sophomore from Ballard High School in Seattle, was the Northern Region MVP in 2010 and has already been named All-Tournament at the Highline Community College tournament to start the season off. 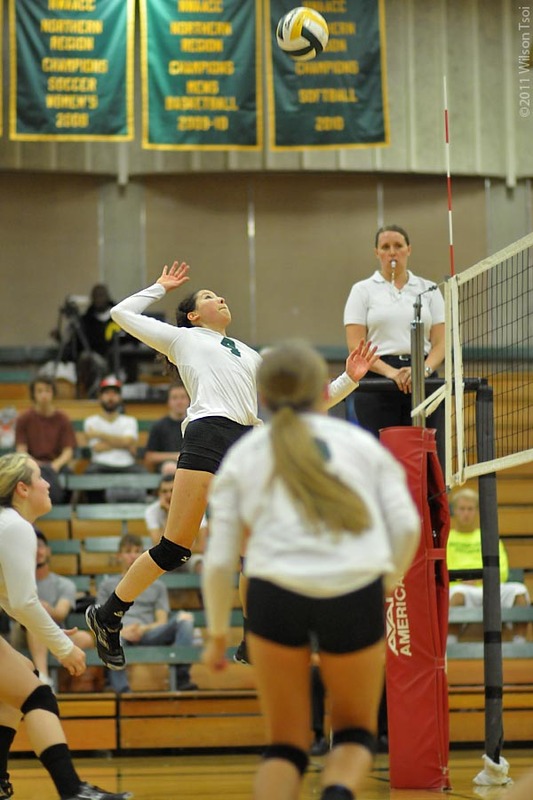 The Lady Dolphins volleyball team defeated Northwest Indian College on Wednesday night at the SCC Gym and takes on Edmonds Community College on Friday night in Lynnwood, WA at 7:00 pm. 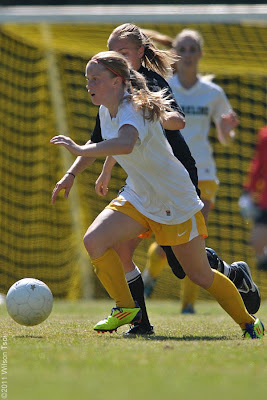 The Lady Dolphins powered past the outmanned Eagles from NW Indian College, 25-2-25-1 and 25-9. SCC is now 8-4 on the season and 1-0 in the NWAACC Northern Region. SCC returns to region action on Friday night as they play rival Edmonds CC in Lynnwood, WA at 7:00 PM. The Shorewood boys’ tennis team won a tight battle against Shorecrest at Shorecrest’s home Shoreline-Park court with a come-from-behind win at No. 2 singles by Justin Oh. He was down 4-5 and two match points at 15-40 on his opponent’s serve. He saved the two points and was able to break his opponent’s serve to tie the match. Oh then won the next two games with long rallies. He won his match 6-2, 2-6, 7-5 to secure the T-Birds ninth win without a loss and keep the team in first place in Wesco 3A. Also winning tough matches were Trevor Cronin in singles and the doubles teams of Issac Brengelmann and Cameron McDowell, and Evan Strandberg and Logan Keebler. The victory gave Shorewood a 9-0 record (both league and overall), which the Thunderbirds extended to 10-0 with a 6-1 home victory over Glacier Peak Wednesday, going into a Monday, Oct. 3 home meeting with Oak Harbor. The loss to Shorewood gave Shorecrest a 6-3 record, which the Scots extended to 7-3 with a 6-1 home victory over Meadowdale Wednesday before trips to Oak Harbor Thursday and Lynnwood Monday. Singles-- Juan Ramirez (SC) def. Hunter Nelson (SW) 6-1, 6-0; Justin Oh (SW) def. David Lyons (SC) 6-2, 2-6, 7-5; Nishant Limaye (SC) def. Miles Jamieson (SW) 7-6, 6-4; Trevor Cronin (SW) def. Andrew Copsey (SC) 6-1, 6-2. Doubles-- Chris Sato-Nick North (SC) def. Eric Berquist-Liam Keebler (SW) 4-6, 6-3, 6-3; Cameron McDowell-Isaac Brengelmann (SW) def. Zach Ottey-Skylar Shibayama (SC) 7-5, 6-4; Logan Keebler-Evan Strandberg (SW) def. Brian Hoover-Chris Hughes (SC) 4-6, 6-4, 6-2. Singles — Juan Ramirez, SC beat Nguyen, M, 6-2, 6-1; David Lyons, SC, beat Nick Ekern, M, 3-6, 6-4, 6-2; Nishaant Limaye, SC, beat Ha-Yang Lee, M, 6-0, 4-6, 6-2; Andrew Copsey, SC, beat Terry Milner, M, 6-2, 6-4. Doubles — Derries-Fijalka, M, beat Chris Sato-Nick North, SC, 6-2, 6-1; Zach Ottey-Skylar Sibiyama, SC, beat Young-Holton, M, 3-6, 7-5, 6-4; Kielan Kolawski-Evan Saunders, SC, beat Duffus-Sherrill, M, 6-3, 6-2, 6-3. Singles — Mozlowski, GP, beat Hunter Nelson, SW, 1-6, 6-4, 6-1; Justin Oh, SW, beat Luangrath, GP, 6-1, 6-0; Miles Jamieson, SW, beat Hill, GP, 6-4, 6-4; Trevor Cronin, SW, beat Kim, GP, 6-1, 6-1. Doubles — Liam Keebler-Eric Berquist, SW, beat Linder-Remlinger, GP, 6-7(5-7), 6-4, 6-1; Cameron McDowell-Isaac Brengelmann, SW, beat Remlinger-Everett, GP. 6-1, 7-5; Logan Keebler-Evan Strandberg, SW, beat Pratt-Boye-Davis, GP, 7-5, 6-1. Freshman Mireya Saucedo from Edmonds-Woodway High School scored in the first half for SCC but the Dolphins let victory slip away in the 83rd minute as HCC tied it up. Saucedo scored on an assist from Lauren Schoonover in the 18th minute. SCC is now 3-2-3 on the season, 3-1-1 in the NWAACC Northern Region. SCC plays at Bellevue College on Saturday at Noon. 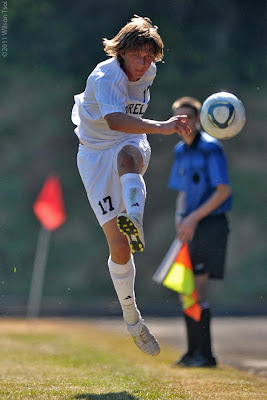 Highline is now 2-4-1 on the season. SCC Men's Soccer. Photo by Wilson Tsoi. In a rematch of the NWAACC Soccer Championship Semi-Final between these two squads from last year, SCC could not muster any offense and lost to Highline Community College 4-0. HCC scored 3 first half goals to dominate play and put the game away early. SCC is now 0-9-1 on the season, 0-4-0 in the NWAACC Northern Region. Highline moves to 6-0-1 overall and 4-0-0 in the Western Region. HCC is ranked #2 in the NWAACC. SCC plays at Bellevue on Saturday at 2:15 PM. 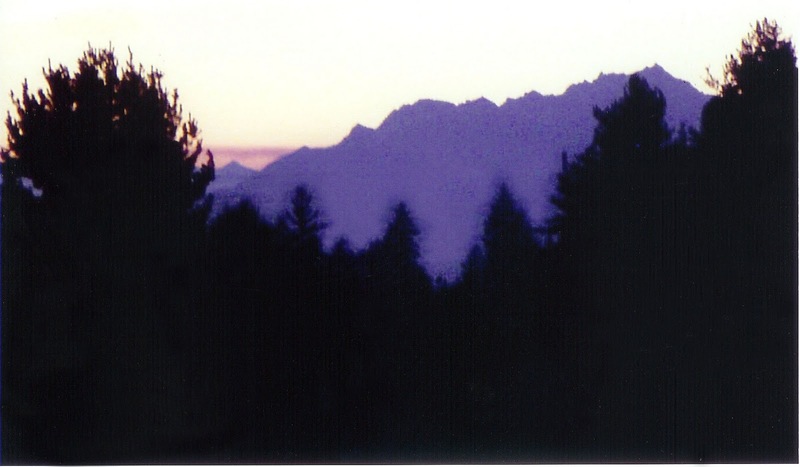 Olympic Mountains from 145th and 15th. 7-Eleven® stores in the U.S. will mark National Coffee Day – Thursday, Sept. 29 – with National CofFREE Day, its own caffeinated version of a celebration. A recent study found that 75% of coffee drinkers enjoy a cup of coffee as part of their daily routine, but on Sept. 29 between 7 and 11 a.m. everyone can make a morning stop at Shoreline and other 7-Eleven stores to receive a free medium-size cup of hot coffee… or cappuccino or latte, while supplies last. 7-Eleven was the first retailer to offer fresh-brewed coffee in to-go cups, introducing it in their Northeast stores in 1964. We source only the finest beans and use 100% Arabica grown in high altitudes in Central and South America, rather than robustas. 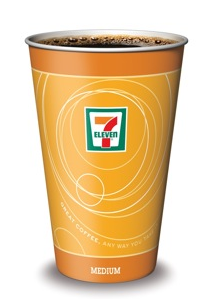 In 2007, 7-Eleven introduced nationwide the first herbal-extract enhanced coffee sold in a cup and called it Fusion Energy. WCofFREE Day is a fresh-brewed “thank-you” to 7-Eleven customers for their year-round patronage and support. With 65 percent of Americans drinking coffee during the week, what better way to say “thank-you” than with a “good morning” cup of coffee. 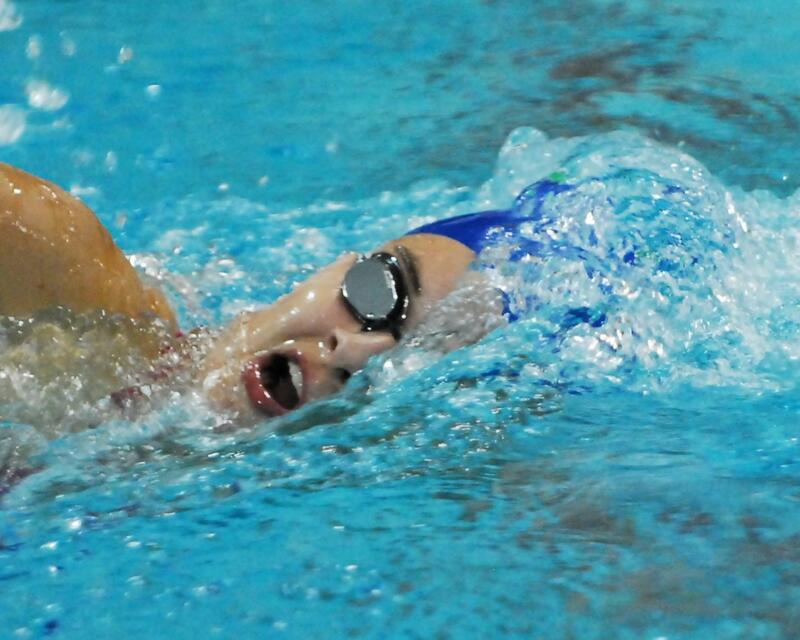 Both the Shorewood and Shorecrest girls’ swimming teams swept their opponents Tuesday, winning every event in defeating their dual-meet opponents. Shorewood won all 12 events in defeating Mariner 146-27 at Shoreline Pool. Annie Hecker. Photo by Jerry Pridemore. The Thunderbirds had State 3A qualifying performances from Annie Hecker in the 500-yard freestyle and Christina Garrison in the 100 breaststroke. Hecker had earlier achieved a state qualifying time in the 100-yard freestyle and been a member of qualifying teams in the 200- and 400-yard freestyle relays and 200-yard medley relay, and Garrison had joined Hecker on the qualifying 200 medley relay team. Shorewood of the Western Conference 3A division takes a 5-0 dual-meet record into another home meet Thursday at 3:30 p.m. against Edmonds-Woodway, like Mariner a member of the Wesco 4A South Division. Shorecrest won all recorded events Tuesday in defeating Lynnwood 125-48 at the Lynnwood Pool. The Scots return to Lynnwood Pool Thursday at 2:45 to meet Mountlake Terrace. 200-yard medley relay-- Shorewood (A. Stenfjord, G. Garrison, A. Tardiff, A. Hecker) 1:59.47; 200 freestyle--S. Taylor (SW) 2:11.69; 200 individual medley--A. Stenfjord (SW) 2:19.41; 50 free--A. Hoverson (SW) 26.88; Diving--K. Riley (SW) 132.58; 100 butterfly--S. Taylor (SW) 1:08.80; 100 free--A. Stenfjord (SW) 56.36; 500 free--A. Hecker (SW) 5:22.14*; 200 free relay--Shorewood (A. Tardiff, M. Ranson, E. Arslanoglu, A. Hoverson) 1:51.27; 100 backstroke--N. Gerbino (SW) 1:09.16; 100 breaststroke--G. Garrison (SW) 1:11.83*; 400 free relay--Shorewood (A. Hoverson, A. Stenfjord, M. Ranson, A. Hecker) 3:51.60. *Class 3A state meet qualifying time. 200 medley relay-- Shorecrest 2:19.25; 200 freestyle--C. Beglaur (SC) 2:22.08; 200 individual medley--A. Glaskova (SC) 2:39.07; 50 free--J. Thornberry 30.14; Diving--not held; 100 butterfly--S. Semon (SC) 1:05.63; 100 free--M. Childs (SC) 1:06.81; 500 free--C. Beglau (SC) 6:26.43; 200 free relay--Shorecrest 2:09.73; 100 backstroke--S. Semon (SC) 1:11.19; 100 breaststroke-- not reported 1:20.93; 400 freestyle relay--Shorecrest 4:36.23. 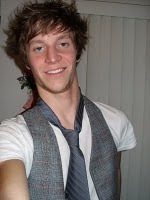 Jake Lagucik. Photo by Wilson Tsoi. Lagucik, the sophomore from Edmonds-Woodway High School, had a solid performance in the 5-0 loss to defending NWAACC Champion, Peninsula College on Saturday. SCC is now 0-8-1 on the season plays Highline Community College on Wednesday at 4:15 PM at Dolphin Field on the SCC campus. 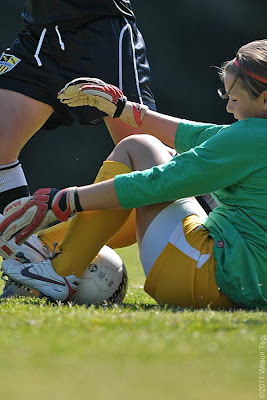 SCC and HCC played in the semi-finals of the NWAACC Soccer Championship last year with Highline coming out on top, 3-1. 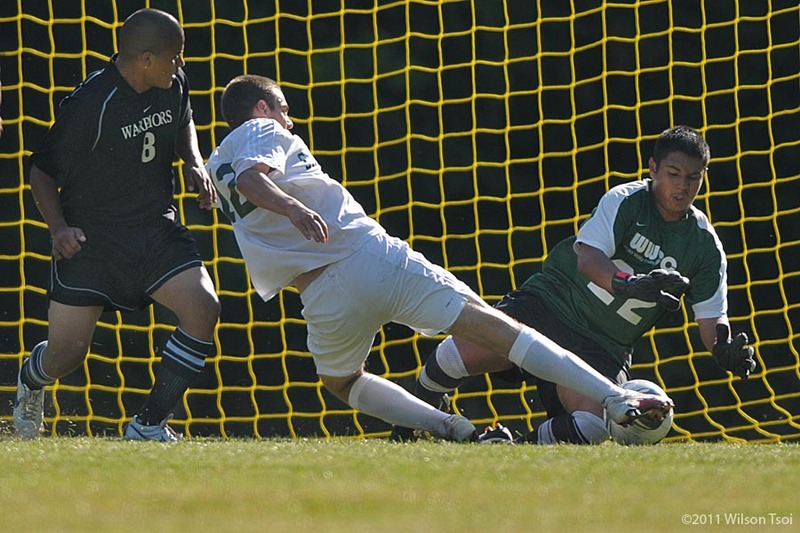 Highline then lost to Peninsula College the NWAACC Championship. Danielle Norton. Photo by Wilson Tsoi. The 5’2” freshman forward from Maryville's Pilchuck High School scored a goal against Lower Columbia College in SCC's 7-0 victory. SCC is now 3-2-3 on the season and 3-1-0 in the NWAACC Northern Region. The Lady Dolphins play Highline Community College at Dolphin Field on the Shoreline CC campus on Wednesday at 2:00 PM. Jazmyn Ray. Photo by Wilson Tsoi. The 6'1" middle-blocker from Ingram High School was dominant in the SCC 3-0 victory over Olympic College on Friday night with several powerful spikes and blocks as Ray controlled the front line. SCC is now 7-4 on the season and 1-0 in the NWAACC Northern Region. SCC plays on Wednesday night against Northwest Indian College in the SCC Gym at 7:00 PM. Peet Montzingo charmed the judges, but charisma wasn't enough to get the 2008 Shorewood grad past the auditions of the X Factor. It was enough to get him and his mother Vicki Montzingo a long segment on the television show, which aired Wednesday evening, September 28. All four judges, including the blunt and often rude Simon Cowell, encouraged Peet, saying he had what it took to be a successful performer. You can watch his audition here. This is Peet's second star turn on a national TV show, as he was a contestant and close runner up in the physical game show Wipe Out! last year. (see story). His mother, Shoreline resident Vicki Montzingo, is an actress (see previous story).